Are you going out this weekend? Well, if you are having plans, you can visit at Mimis Cafe. There are many Mimis Cafe stores/restaurant all over United States. If you want to get an amazing deal from Mimis Cafe. Let me give you these Mimis Cafe printable coupons which will give you a $10 discount on $30 or more purchase in-store. $30 is the minimum purchase required for this deal. 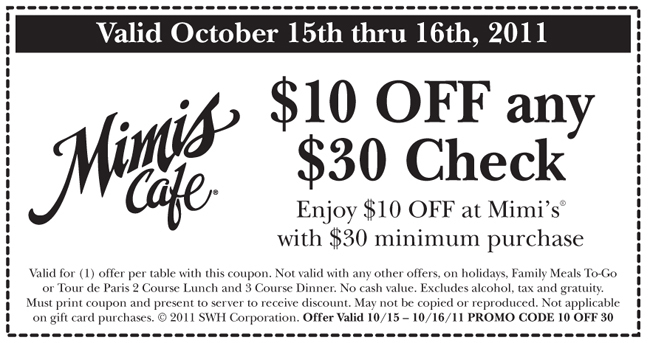 These Mimis Cafe printable coupons are all valid now through October 16, 2011 only. There are more offers which are soon to come. If you want to know them all. Just stay with us here and you will learn it all. Have fun using all the offers shoppers.